You might be wondering why did I group two towns together for this blog post? It is not because they are not worthy to have separate posts or that they are not beautiful enough. The reason is the fact that I only spent less than 24 hours in each of them (so there would not be enough content to spread out among two posts) and they do, indeed, have some similarities. 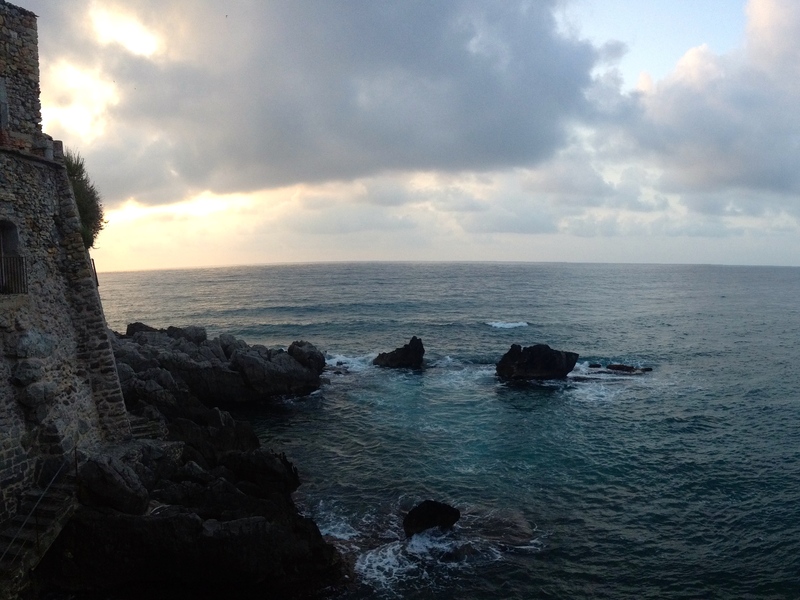 Cefalù is a small town a few hours away from Palermo. A friend of ours has made a point about going there when we were staying in Palermo, saying that it was his favourite town. He did not disappoint. Cefalù is adorable. Its center is so small that you could walk back and forth a few times within the hour if you wanted to. I admit that it would be hard to not stop at every little shop along the way though. Narrow streets are so narrow that every time a scooter or a car (!!) is trying to get by, you literally become squished to the wall. It is quite an experience. 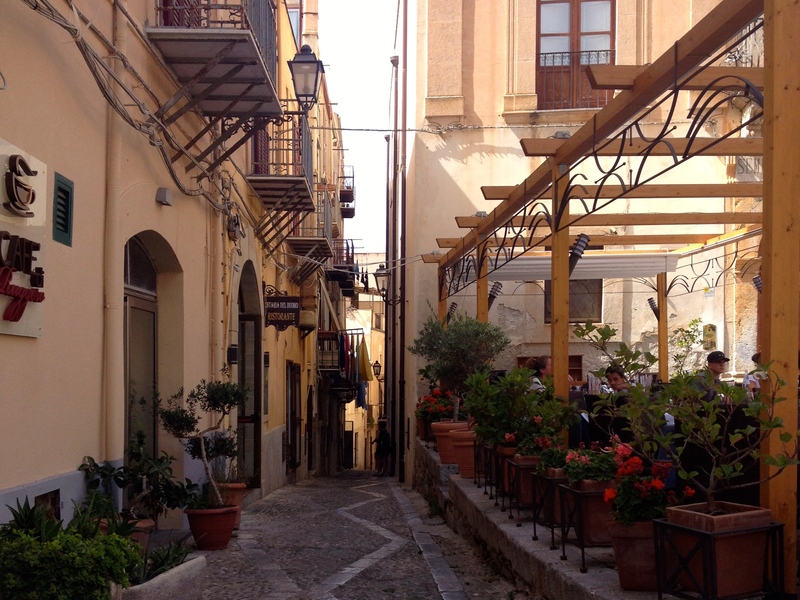 The streets breathe with history – you probably already guessed by now that this is the case for all Sicilian towns – and are full of flowers. An indisputable highlight of our visit was a restaurant with the view you can see in the picture below. I’m not going to talk about the food too much, because it is very hard to find bad food in Sicily. It makes sense if you think about it – all fish comes from the sea you are looking at and vegetables grow happily in this beautiful climate. 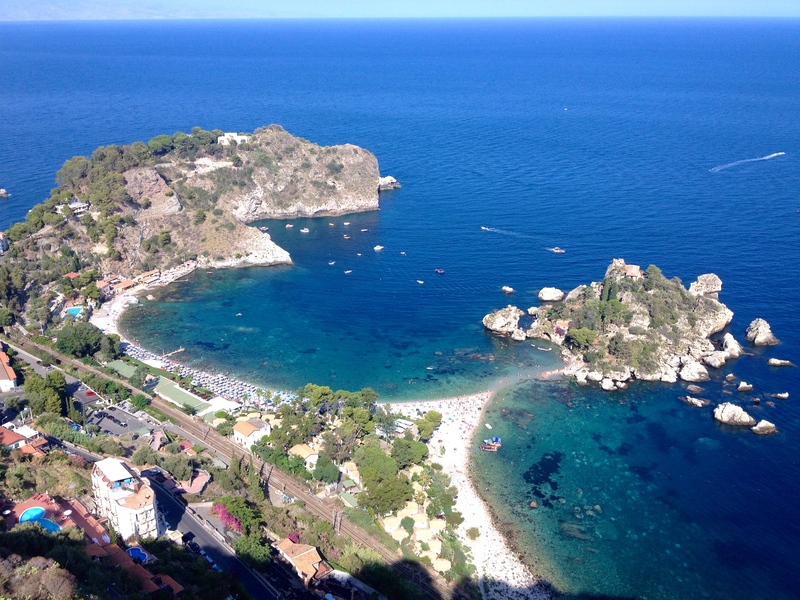 Even a smaller town – Taormina is a favourite among my fellow Russians. I’ve heard Russian speak at least four times during the short visit. 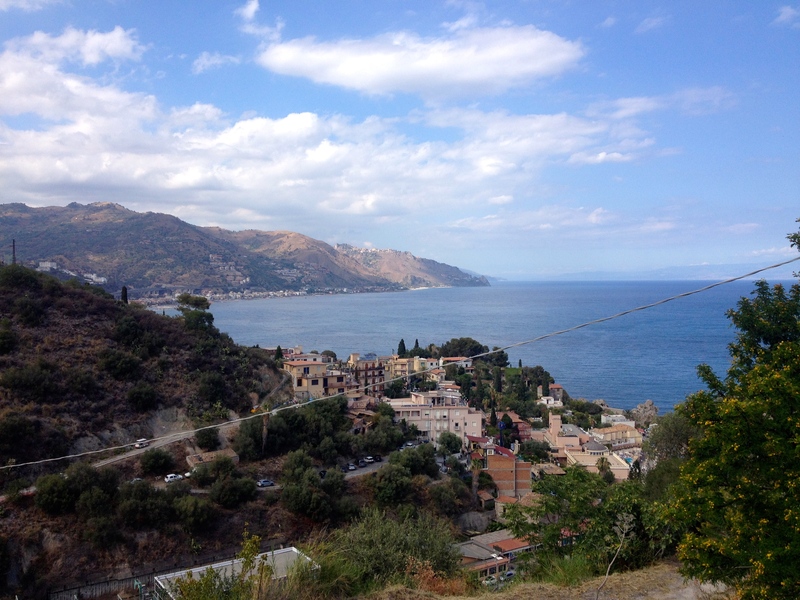 Taormina is just a short drive away from Catania, the city, where we were based during the trip. 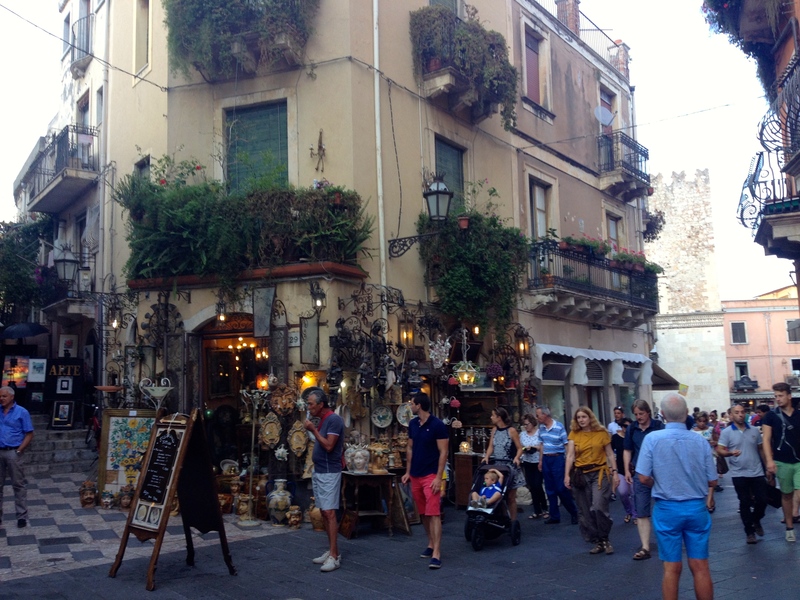 Taormina is similar to Cefalù in a sense that they both are very small and touristy towns, with a lot of shops and cafes in the town centres. Taormina also has old narrow streets just as gorgeous. In a competition for a place in my heart the T-town nevertheless wins. The city centre is located at the top of the hill, which you can reach by taking about a million (ok, not that much) stairs from the sea level. Every step is oh so worth it. The views that are opening on your walk up will simply leave you speechless. 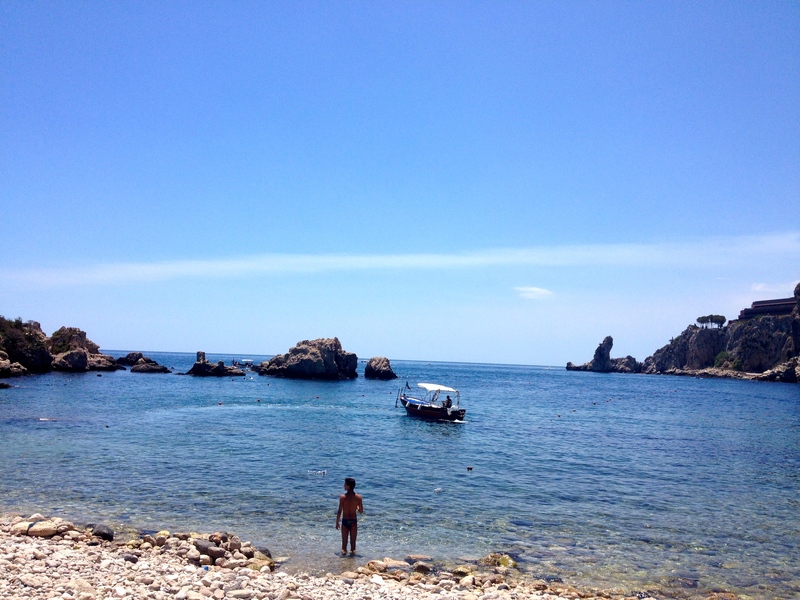 Finally, the beach in Taormina is not sandy, it’s pebble, but it is one of the most beautiful beaches. Just look at the water and the little stone islands. One of them even had a little cave that you could walk to, because the water was not so deep. Reminiscing about this trip has once again confirmed my conviction that visiting little towns when traveling to a new country is a must. Don’t be afraid to skip yet another tourist attraction in a capital, which you’ve seen in dozens of tour guides already, and replace it with a guaranteed scenic drive to a nearby town. Only here you will be able to truly experience the culture and a way of life of locals and get a real taste of foreign life.